Even though there's a growing population of young folks — especially families — buying RVs and even going full-time, the primary target demographic remains a bit older than us. So to spruce up our RV's interior a bit, we've started painting and reupholstering. Cue the new Ardent Camper blog post series intro music. 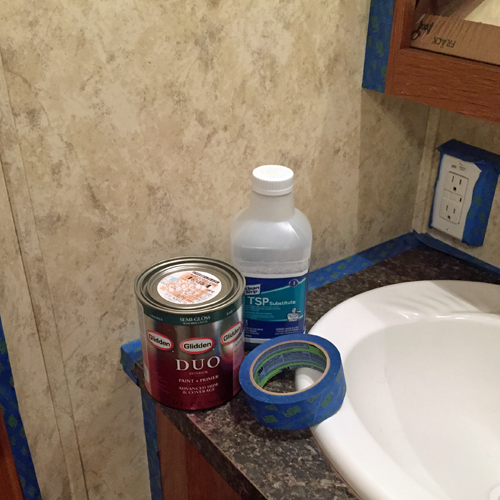 It's time for... RV Makeover: Bathroom Edition! 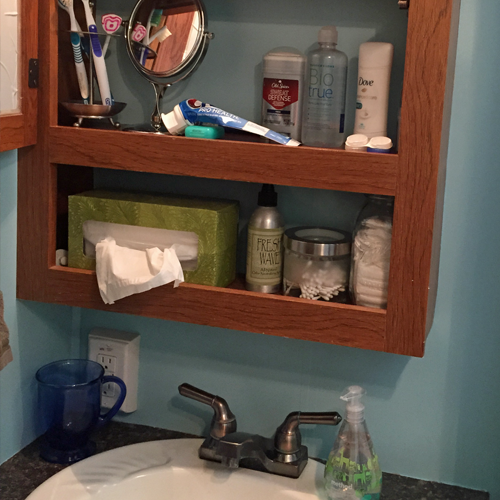 We'd hired folks to take care of some big projects, but when it came to DIY fixes, the first room I decided to tackle was the bathroom. It's small, and there wasn't a lot I wanted to do to it, so I knew it'd be a good testing ground. Here's how it looked before I got my hands on it. To tell the truth, I had already made one change before this photo was taken. 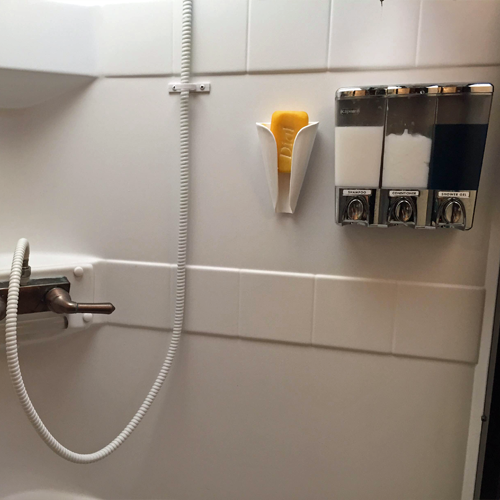 The hand towel hanger that came with the RV had fallen out of the wall, so I had replaced it with a spare one we'd had on hand. This meant the hardware no longer all matched — and it still doesn't — but that'll be on the to-do list later. We need a new faucet anyway. All I wanted to do for now was paint the walls, so I did some reading on how this can be done, or even if it should be. The should it? part turns out to be a matter of personal choice, and usually what scares most people off is fear of losing resale value. We figure we're not going to make a profit on the RV anyway, so why not make it our home? For the how to? part, it turns out RV walls are fused to vinyl wallpaper, so there's no peeling it off. It can be painted over, though. First, the surface must first be cleaned with TSP and left to dry. Then it can be painted with high-quality latex paint. 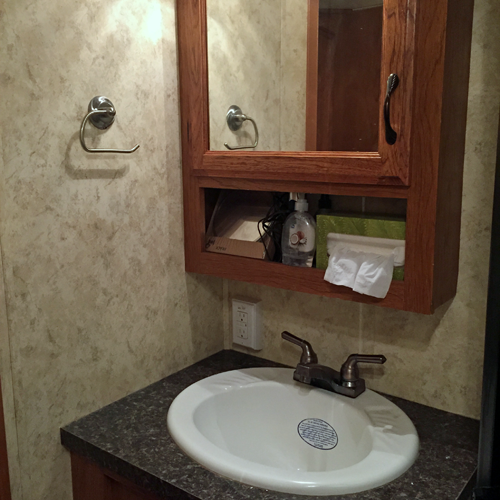 Semi-gloss tends to be the sheen of choice for RV interiors. 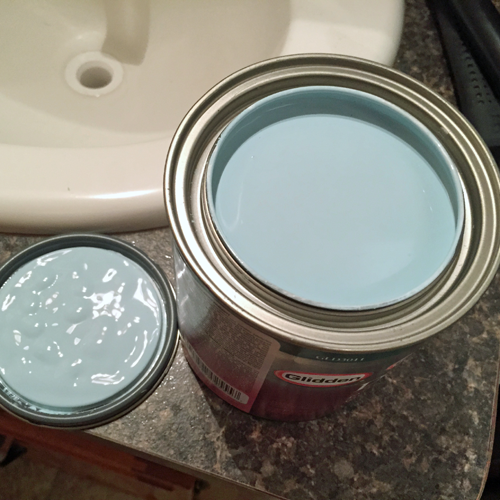 The color I chose was Glidden Tropical Lagoon. 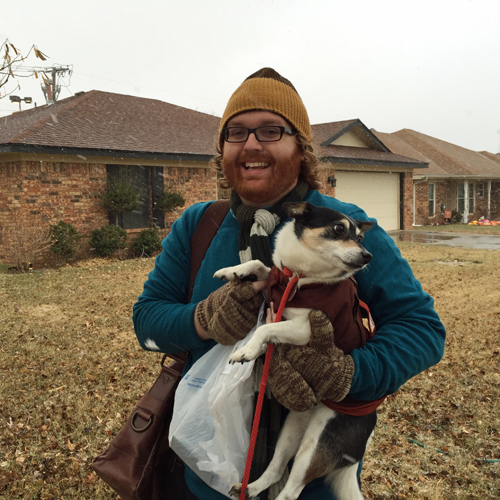 This might have had something to do with the fact that it was literally freezing outside when I started this process. The project took about 3 hours and required one session of touch-up but no second coat. The hardest part was getting behind the toilet. 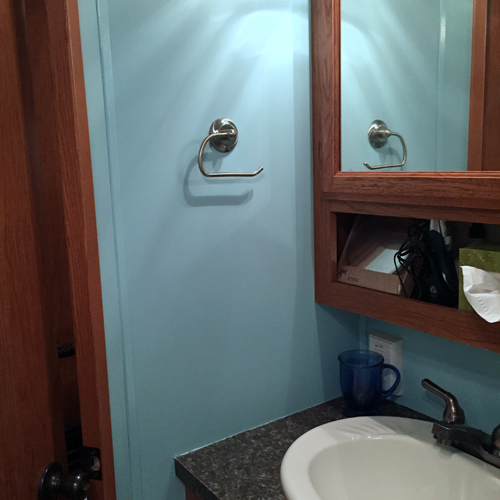 I even painted the inside of the medicine cabinet! Sinks aren't everything. We've also done some work tamping down all the stuff flying around our shower when we bump down the road. So what do you think? Too bold or totally perfect?